Later it was reported, Churchill expressed privately he never believed one word of what Stalin was promising. However, both Churchill and Roosevelt were aware without Russia ‘on-board’ the final victory in Europe was far from assured. Thus, with grave reservation- both went along with it. In principal it was agreed by design that irrespective of progress and geographic position of either side, the Red army would be the eventual liberator of these states. One has to bear in mind the immense contribution made by the USSR during WW2. Estimated combined Russian civilian and armed forces losses were believed (conservatively) to be somewhere in the region of fifty million people. During the months of April/May 1945, with the allies having already advanced well into German territory it was clear the end of the second world war was finally in sight. A time of optimism and rejoicing swept across the occupied countries of Europe. None more so than in the region of Sudetenland, which had endured occupation by the Nazis for longer than any other country/regions in Europe. By the end of April 1944 British and US forces stood at the threshold of the Czechoslovakian border. Eisenhower was under considerable pressure from both Bradley and Patton to launch an offensive into Czechoslovakia. Indeed, both Patton and Bradley were of the view liberation of Czechoslovakia was very do-able. Patton genuinely (morally) for some inexplicable reason particularly wanted to do all he could to help Czechoslovakia. Maybe his reasons were because Czechoslovakia was the only slavik country ever likely to be within reach of the allies. Both he and Bradley were feeling frustrated by Eisenhower’s reluctance to support them. To be fair to Eisenhower he had previously proposed to the Russians a limited advance of his forces, covering the westerly sector of the country. Apparently on the 4 May out- of- the- blue Eisenhower took the decision to send Patton into western Czechoslovakia. Earlier that day he had sent a telegram to ‘Antonov’ advising the Soviets of his intentions. He also outlined to them a possibility at a later stage advancing as far the east bank of the River Vltava. Significantly the river ran right through the capital city of Prague. Thus partly liberating the capital city. So the liberation of western Czechoslovakia began. Early on the 5 May Patton’s forces of the 1st, 2nd, and 97th Infantry spearheaded the assault. Overcoming some initial heavy resistance, the towns of Horsovesky Tyn, Domazlice and Kdyne were liberated. Eventually liberating the major city of Pilsen (famous for it beer) situated just 50 miles from Prague. Here strict orders were given to Patton –“that’s it..no further! So virtually until the end of the war Patton and his 3rd army remaimed in Pilsen metaphorically as holidaymakers. sadly, Pilsen was to mark the end of Patton’s efforts in the liberation of Czechoslovakia. Patton became an iconic figure to the citizens of west Czech (Sudetenland) especially in the large city of Pilsen (only 50 miles from Prague) where the citizen’s gratitude is boundless. To this day, he is still idolised as a great hero. In conclusion here is the great ironic twist to the story: In 1948 when the communist puppet government was installed by the Kremlin, the harsh totalitarian regime began meddling,manipulating, and pervertIng ww2 history records in Czechoslovakia. The news story was; it was the glorious and all conquering red army who won the war. 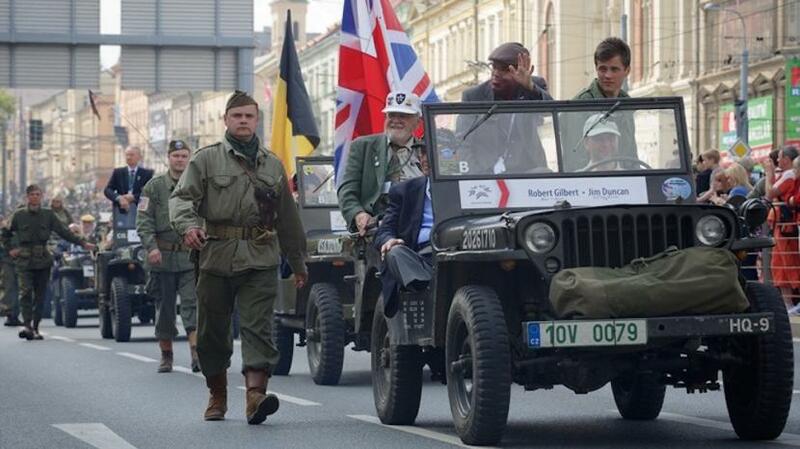 Western allied forces contribution was obliterated from Czech history. Patton’s exploits and the US a3rd army’s liberation of west Czech was never to be talked about. All remnants traces and 3rd Army artefact in the town of Pilsen were confiscated. However, many brave souls hid some of these artefacts which didn’t reappear again until 1991. Since then to make up for the injustice of all this the city of Pilsen have built a huge statue of Patton together with a water fountain in the centre of Pilsen. Thus ensuring the contributions of Patton and his 3rd army and what they will never be forgotten! general pattons 3rd army historic liberation of-pilsen WELL done GEORGE! Costs we still working on this one!